Admit it. You’ve been wondering whether Thomas Keller’s new Cup4Cup gluten-free flour is worth the $19.95 (for three pounds) price tag. So was I.
Thomas Keller, the extraordinary culinary talent and restaurateur embraced “gluten-free” in a serious way. First his restaurants, The French Laundry in California and Per Se in New York City, started to serve delicious, imaginative gluten-free bread and pastry to gluten-intolerant diners. And then late last summer, he put his stamp of approval on a gluten-free flour blend developed by one his chefs, Lena Kwak. I read with fascination when wheat eater Florence Fabricant wrote kindly about it in the New York Times saying, “It works very well, though the cake textures were more delicate than usual and I found that the pie crust was best rolled somewhat thicker for ease of handling”. I read Kelly Courson’s (Celiac Chicks) glowing account of the gluten-free tea that Keller held at Per Se last November to launch his flour venture. I sat tight and let Keller and his team work out any of the kinks. But finally, curiosity got the best of me and I could wait no longer, especially since I’d been receiving questions about it from people who use my cookbooks. So this weekend I drove to my local William Sonoma and paid for my very own bag of Keller’s very expensive gluten-free flour. I have tested every all-purpose gluten-free flour blend on the market and all the rice flours available in the New York metro area. I use the exact same recipe whenever I test new flour – I make my vanilla cupcakes from Gluten-Free Baking Classics. It’s simple, basic and it doesn’t have a lot of ingredients. Any problems show up right away because there is nothing to hide behind. I actually go out of my way to illustrate my flour testing mythology in my basic baking classes. I pass out samples of two vanilla cupcakes made with my brown rice flour mix, but each is made with a different brown rice flour: the first with Authentic Foods (my first choice rice flour) and the second with Bob’s Red Mill (my second choice rice flour). The cupcake made with the Bob’s Red Mill has a slightly tighter texture and is slightly smaller than the Authentic Foods one. It doesn’t rise as well, contracts more after baking and is very slightly gritty (but far less gritty than cupcakes made with other brands). I also pass around two paper cups filled with plain brown rice flour for the class to feel: one has Authentic Foods (it is powdery like wheat flour) and the other has Bob’s (which has a slightly gritty feel). I often pass around two cups with those same two brown rice flours mixed up into my flour mix to show the class that potato and tapioca starch doesn’t actually cover up the grit, if it’s there. 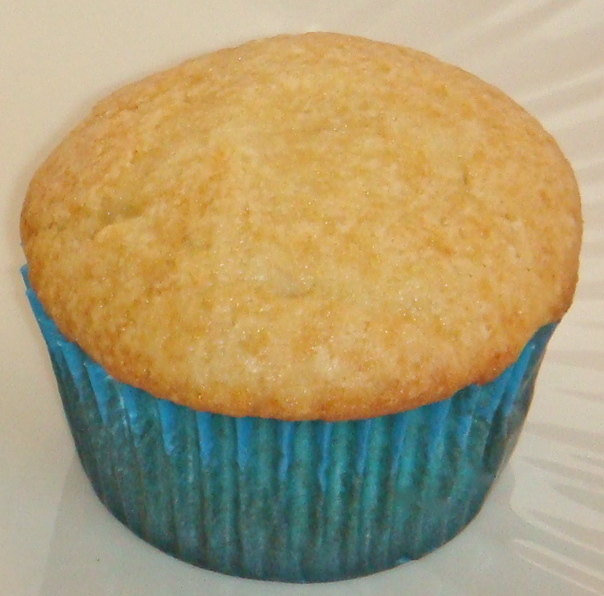 I employed my standard vanilla cupcake testing methodology to test Cup4Cup gluten-free flour. The blend contains cornstarch, white rice flour, brown rice flour, milk powder, tapioca flour potato starch, and xanthan gum. The package says it can be used to replace wheat in equal amounts in “most recipes”. It also said there were tips for use on the website, but I didn’t’ find any. However, since the package said the flour was “especially fantastic” in things like quick breads and muffins, I figured I’d be safe with cake. I dug out the original wheat version of my cupcake recipe (which I’d used for more than a decade before being diagnosed with celiac) and got started. The only difference between the recipes is that the wheat version uses 1 1/8 teaspoon baking powder instead of the 1 1/2 teaspoons used in the gluten-free version (and my GF version has xanthan as an added ingredient). First I made gluten-free vanilla cupcakes with my brown rice flour mix (which uses Authentic Floods brown rice flour). Actually, I used Authentic Foods GF Classic Blend ($11.50 for a three pound bag) which is my brown rice flour mix already made up (I do not get paid by Authentic Foods; I just think they have great flour). Although I have a double oven, I waited to use the same one to bake the Cup4Cup cupcakes in order to be consistent. I opened the Cup4Cup bag and felt the flour. I thought it had a bit of a gritty feel so I did a side by side with the Authentic Foods GF Classic Blend to be sure. There was, indeed a difference in grit. Next, I compared it to some of my brown flour mix made with Bob’s Red Mill brown rice flour (I use it for pizza crust). It felt similar. Ok, so Cup4Cup has a tiny bit of grit. Next, I mixed it up in the cupcake batter and saw a huge difference. The batter was glue-like and gooey and didn’t flow into the cupcake cups like the Authentic Foods batter. I actually had to push it out of the spoon to get it into the cup. I realized that it must have a relatively huge amount of xanthan gum in it, at least compared to what I would use for a cake or muffin or sweet bread. And as all of you who use my recipes know, I do not believe in one-size fits all gluten-free flour blends that include xanthan gum; I have found that the amount needs to be calibrated based on what you are trying to make and the other ingredients in the recipe. The baking proved interesting. As I periodically peered thought the glass in my oven door, I thought at first that the cupcakes would never rise. But then they suddenly started moving and rose spectacularly, as high as the Authentic Foods cupcakes. When they were finished baking (interesting, they took exactly the same amount of time), they were a bit pale. As they cooled, they shrunk just as spectacularly as they rose. The large amount of xanthan gum in the blend pulled those cupcakes in and made them smaller than the Authentic Foods version. Ok, so the Cup4Cup cupcakes were slightly paler and slightly smaller. But the truth is in the tasting. Blind taste tasters stood by waiting for bites of the cooled, unfrosted cupcakes (thank you friends and family!). My first question is can you tell the difference between the two? Everyone could tell the difference between the two cupcakes. My second question is what do you taste and feel in your mouth? The Cup4Cup cupcake was called “rubbery” and “gummy” in texture and “grit” was detected. The Authentic Foods was said to be “like a real one”, “tender”, and no grit was felt on the tongue. The vanilla shined though in both. There was no after taste in either. I would really like to see Thomas Keller and his team make this flour blend better. On the Cup4Cup package it says, “Gluten-free Flour But You’d Never Know It”. I guess that might be true for some people, especially those who had been using another gluten-free mix that was grittier and had just as much xanthan gum as the Cup4Cup. But the wheat eaters in my group certainly could tell. Bad wheat cupcakes tend to be either dry and flavorless, or have an off-taste from artificial flavors, but they rarely tend toward “rubbery”. 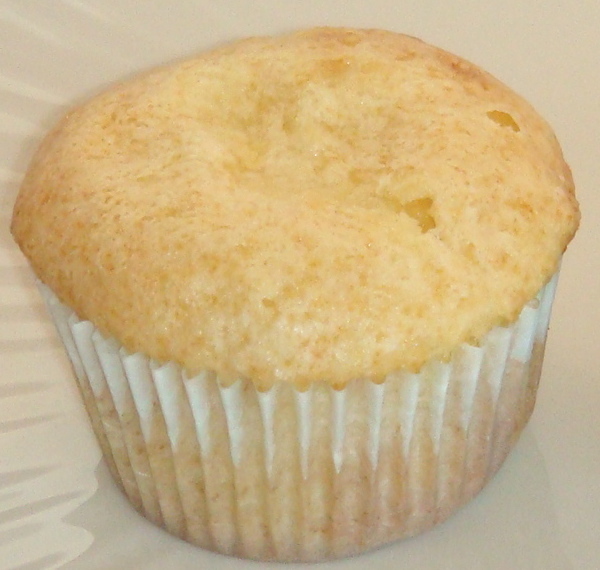 In addition, the often well-intentioned addition of potato flour and/or sweet rice flour in other gluten-free blends can contribute to a smaller, tighter texture, and sometimes, to a gummier baked good, so perhaps gluten-free bakers who use blends with those flours might not notice the less-than-perfect texture of the Cup4Cup cupcakes. But for me, $19.95 is a lot to pay for a flour that doesn’t do as good a job as the (less expensive) Authentic Foods flour I use now. I’m happily staying with what I have. P.S. If Keller and his team ever do improve it, I will go buy more and test it again. I wondered how long it would be before you did a comparison for us. Thanks! You would think Thomas Keller’s crew could learn from the pros instead of attempting to re-invent the celiac wheel. Authentic’s Blend is still too pricey for my comfort zone. I use your mixture recipe, but with a brown rice flour most people don’t know about. Small company, and very well priced. They recently started milling it finer, and it is even better now. Glad you found it useful! And yes, why does everyone have to keep reinventing the wheel. The proportions I use for my all-purpose flour mix (but not my bread mix) were developed by the University of Washington more than 25 years ago and they work really well with the right rice flour! I stayed with what the other bakers were using at the time so that I could help raise the learning curve. Now it seems everyone is starting at the beginning. Anyway, would love to know your finely ground flour source so I can tell others who might be interested. I am really glad that I looked up C4C & saw your write-up on this flour. My son is gluten-intolerant and I have been looking all over the place for a wheat flour substitute. I will give F Classic Blend a try. I love Barefoot Contessa and will be using this flour to make her Bakes Blintzes with Fresh Blueberry Sauce. If you make it before I do please let me know how you like it. Thank you again. Hope you enjoy the Blintzes! That was really interesting, Annalise. Thank you for doing that so I don’t have to. I have been wondering about that flour, too, but I will stick with Authentic Foods! It’s still the best! It might be a bit more expensive, but it makes all the difference in the world in terms of texture and taste (and appearance)! I had not heard of Cup4Cup but would never spend that much on flour when I know how awesome Classical Blend is with your cupcake recipe and no grittiness whatsoever! Thanks for testing the product and comparing them. My pleasure. You are very welcome! My consistent complaint for years of making GF bread is: They come out of th eoven high and beautiful and as they cool they “deflate”, whyyyyyyyyy??????? I have found that when the recipe is configured correctly and has enough whole grain (versus starch), the bread will “only” contract a little bit. Breads deflate because even if you add xanthan gum to give them structure in place of gluten, the gum won’t do the trick 100%. And of course, if you add too much gum the bread really shrinks; too little gum, and it never rises well to begin with. The trick is getting the sweet spot for the amount of gum, balanced with whole grain, lightened with just enough starch- art and science. Also, you want a slow rise on most breads so that the xanthan gum can start to set. When I bake gf sandwich bread in particular, my breads that rise too quickly typically fall more than one that rise more slowly. But if you’re having more serious deflating let me know- or maybe your xanthan gum is really old? What a great post! Our family is dairy-free and corn-free too, so I knew that I couldn’t test recipes with this flour, but I have had readers wanting to know if Cup4Cup will work in my recipes. Since Keller has such an impressive pedigree, I figured it would be a simple substitute. Well, one of my readers tried it in my sugar cookie recipe (we both thought that it would translate well) and it was an ooey-gooey, elastic mess that you couldn’t dream of rolling. She went back to making them with the original blend of brown rice, potato, tapioca. Interesting stuff! I guess I won’t be too heartbroken that my family can’t eat it. 🙂 Thank you for sharing your findings too. Now I know where to send people who are curious. Thank you for sharing!! Good to know that I wasn’t alone in coming up with something that wasn’t what I expected (from Thomas Keller!). Thank you, Annalise! This was so well done, no surprise coming from you. I continue to get consistent, fabulous results from your recipes and flour mix. I was one of your North Texas GIG red velvet cake testers and I use that recipe all the time. One of my gluten eatin’ friends doesn’t care for cake, but she loooooves my (your) 🙂 gf red velvet and requests it for her birthday. She hides it from her kids! Love ya. Good to know my infamous Red Velvet Cake testers are still riding high. I’ll be coming to all of you soon with some second round recipe testing for a new book. I completely agree with your assessment, Annalise. I also tried some of the mixes using the c4c–the pancake mix in particular was so gritty and the waffles were too dense and gummy. I’m surprised Williams-Sonoma would sell something that is so inferior and at such an inflated price! I’ve also found your cake recipes are simply the best, regardless of anyone else’s that I’ve tried. Thanks for the careful work you put into your recipes — they’ve made a huge difference for our whole family. Thank you for telling about your pancake test. I was thinking of tying to make something simple to use up the flour, but now I know not to bother! I have never found a flour to match Authentic. When I need a cupcake, yours is always my go-to recipe and everyone loves it…non gf as well as gf. I had seen the cup4cup flour on Martha Stewart, but when I looked at ingredients, pretty much knew it wouldn’t match up. Thanks for doing the testing. Now I know. My ten year old grandson is the one I have to please as well as his non gf brother and sister. I keep both the Classic blend and the All Purpose in my refrig. You are very welcome! Perhaps Martha will have a REAL gluten-free bake off on her show someday. I volunteer! Hope you keep finding recipes you like in my book for your grandchildren! Thank you for doing all the work (and writing the books.) Many GF recipes close with “experiment, learn, have fun…” Baking food science in general, GF in particular,does not work well that way. For instance, if a cake is dry or crumbly adding more liquid isn’t necessarily the answer. You do the tedious science trial and error work. Thank you I (who has been doing this 3 years and love to bake)appreciate it. Thank you for your very kind words. I also find it curious that many people think they have to start at the very beginning when converting recipes. It isn’t fun to make utterly average, weird tasting, strange textured baked goods. And it can be expensive. It is good to know that my efforts are appreciated. After much fanfare, I tried Thomas Keller’s Cup4Cup tonight on a slightly non-traditional recipe: Asian steamed buns (recipe from Momofuku). The result? Disaster. I even tried it twice to make sure that my ingredients or other factors were not off. The basic problem was that the dough I tried to create had the wrong consistency; it was WAY too sticky, which indicates to me that they used too much xantham gum. After blending in a mixer, the dough did not clump together into a ball, did not rise at all after resting for 1+ hours, and was too sticky to roll or shape by hand. I just had to throw it out — twice. For a $20 bag of flour, that was a bit much. I won’t be buying Mr. Keller’s flour again. It is exciting that you were trying to recreate Momofuku’s steamed buns (and sad and it was wasted because of the Cup4Cup flour blend). I really admire your effort. Although I have been able to recreate asian dumplings (which I had eaten for many year before becoming gluten-intolerant) I never tried to make steamed buns because I couldn’t remember what they tasted like— and what the texture was like. Lucky you that you know. In any case, if I can help in any way, drop me a line. I’d love to be able to make steamed buns someday. Thank you for this review. I have also tried the Cup4Cup and did NOT prefer it over the Authentic Foods Classical Blend. Thank you for your conformation of my test results! And I agree with you that it would great if Authentic Foods was more readily available everywhere. But then, I guess it helps to make the things we bake with it all the more special. Why mess with perfection?! You can’t improve on something that’s already excellent! Mmmmm, made crepes for lunch today. Filled them with homemade, warm, blueberry preserves from berries I picked and froze in June, and vegan cream cheese. Yummy and satisfying. Good to hear from you!! Glad to see you’re making good use of my recipes! Thank you for this post! I have been so curious about the Cup4Cup flour, and you just saved me a 40 minute drive to my nearest Williams-Sonoma and 20 bucks on top of that! I just love baking and my curiosity has led me to try so many GF mixes and flour blends. The thing is, your flour mixes are the ones that I always return to and rely on. I have never found a blend or a mix that outshines yours. I am so grateful for all of the work and experimenting that you have done (and continue to do). I field tested a couple of chocolate cake recipes for you back in the fall. Would love the opportunity to do any more field testing if you need it! Thanks for all the great information! Glad to be of service! It is so good to hear from you here. You have been a wonderful tester and I will be calling on you again very soon! And thank you for all your very kind words. Nearly Normal Flour in a comparison test with the Authentic blend. I have had good luck with Jules products. Her bread flour is $10.00 in round figures. Good but pricey. She uses Expandex in her mixes. Any experience with Expandex? Actually, someone also asked me about this on Facebook. I said that taste was an issue for me in the test, along with the total lack of whole grain (mine is 2/3 whole grain). I didn’t get an off flavor with Jules’ flour, just kind of an empty taste in spite of the vanilla. It just seemed to lack a certain something – at least to my palate. The cupcakes were pale and very dense and tight -compared to the Authentic Foods ones. They were actually even smaller the next day. Also, I really don’t like having xanthan gum in a mix because I don’t believe in one size fits all amounts when it comes to calibrating recipes. I’m a bit uncertain by what exactly it is they do when they process the tapicoa flour to make Expandex and I try to avoid eating foods that contain it. But I tested Expandex early on when it came out. I didn’t like it in my baked goods – made with my recipes — when my brown rice flour mix was made with Expandex in place of the regular tapioca flour. I didn’t think it added anything to my texture. But I think the Authentic Foods extra finely ground brown rice flour makes such a good baked product that it is hard to improve upon (at least in GF baking). You know, I think it comes down to the fact that people all have different taste palates and Jules’ flour is well liked by some people. Perhaps they like it in her recipes best, but I’m not sure. I apologize in advance for this long post, but I’m just so excited about trying your baking recipes! I was diagnosed about 6 months ago with gluten sensitivity, and in researching GF cookbooks on-line I kept reading that your baking cookbook is the absolute best around, so I bought it. But I must admit that I’ve been too intimidated by the whole GF “different-ness” in baking to try anything yet! Just finally got up the nerve to try your multigrain sandwich bread recipe. I was just at Williams Sonoma two days ago to buy regular (not non-stick) bread loaf pans for the recipe. (I’ve made bread nearly my entire life, but my pans were non-stick and thankfully I read your instruction to use regular pans.) While there, a salesperson pointed out the Thomas Keller C4C flour blend and raved about it. I know of Thomas Keller and highly respect him as one of the best chefs in America, so I figured it was a really well thought-out blend (I’d never buy it due to the incredible price alone — $20 for 3 pounds!!) So glad you did the work for us and determined that it’s not as good as your flour blend. Since being diagnosed my biggest longing is for REALLY good whole grain bread. I’ve tried several locally made “artisan” GF breads and I detected a really weird, strong taste in each of them — probably due to one of the GF flours used or the proportion of flours. I was intimidated to try your bread recipe because I’ve read so many blog posts on various GF sites about how many things can go wrong with GF bread, and I know making GF bread is nothing like making wheat bread. But a friend who’s GF made your bread and brought me a piece, which I toasted with my favorite Irish butter … and Oh My Goodness. REAL BREAD again!!!!! Fabulous bread in fact! Even the texture was perfect! I thought I’d have to do without it forever. THANK YOU!!!!! I immediately read all the intro pages to your baking cookbook, went out and bought all the special ingredients, then the new bread pans, made up the flour blend and ran out of time to actually make it. So I’m going to make it this coming weekend. Question — can I double the recipe and make 2 loaves at the same time? My old beloved wheat bread recipe made 2 loaves, which sure saves time. But I wasn’t sure if that would work when making your multigrain sandwich bread. Also, in writing about extra finely ground brown rice flour in the intro to your book, you write that Authentic Foods sells the only one you’ve found that’s ground finely enough “other than those sold in Asian grocery stores.” There is a huge Asian store close to me (where I bought tapioca starch/flour really cheap), and I’m sure they have brown rice flour. Have you found that the ones sold in Asian stores are ground finely enough? That would be SO much cheaper than ordering AF’s from California — the shipping is exorbitant! Also, one of the artisan GF bakers in my town said that she believes that the Lundberg brand of brown rice flour is ground finely enough (it’s what she uses in her muffin and other GF recipes). Have you ever tried it? I can buy it in bulk locally. My next attempt will be your pie crust recipe. I have dearly missed my own recipe for quiche that my husband and I love. My grandmother taught me to make pie crust decades ago and I have to say her recipe is fabulous, so I had thought I’d never be able to eat pie or quiche again. A million thanks for all your hard work in developing so many wonderful recipes so that we GF folks can again eat wonderful baked goods!!! It is a long post! But thank you for taking the time to write it all down. Some good feedback and excellent questions. Yes, you can double the bread recipe as written, and I’ve done it myself. if you’re talking about the Multigrain Artisan Bread, I believe it should say so at the top of the recipe, but if you book doesn’t have that, please let me know. I would suggest that if you’ve never baked a gf loaf before, try it first as a single – just in case. And as for the flour, I haven’t had Lundberg in a while, but when I last had it, it wasn’t as good as I wanted in my recipes. That said, I would be open to trying it again. They have other fabulous gluten-free products (crisps and different kinds of rice) and I have tried many of them. I don’t have a good Asian grocery store close to me where I can buy flour that I trust, but many of my readers, especially on the west coast and in Vancouver do, and they tell me it works well. If you can swing it, try the Authentic Foods at least once (and get their Sweet Rice flour for the pie crust; you don’t use a lot in each recipe and it lasts a long time). Buy a couple bags and spread the shipping cost. Then you can try other flours and compare and find the best substitute. Right now, it is the best I have found, but things can change! Please let me know if you have more questions. And thank you for all your kind words. Interesting stuff. We’re very lucky in the UK to have a gluten free blend which works wonderfully with a little extra liquid and xanthan gum. It’s also priced at around £1.50 for 1kg (just over 2lb). I can’t believe what the American blended flours cost! Having said that, I have just ordered a range of single flours to try out some of your recipes because I don’t like being reliant on a flour blend – I’m so excited to try your babka recipe as soon as my flour arrives! If you’re ever in the UK or have friends visiting, Doves Farm gluten free flour is available in all supermarkets and it would be interesting to see how they compare to the brands you mention. I will keep that in mind, because I do get over there every now and then. Thank you. And I hope you enjoy the babka! I have tried Cup4Cup and made sugar cookies with it and they were the best GF sugar cookies I have ever made, better than when I used authentic foods blend. I Like authentic for cakes but cup4cup has worked in many of my recipes. Not sure if you used my sugar cookie recipe or Authentic Foods GF Classic Blend, but it’s nice that you found a recipe and flour blend you’re happy with. I believe that the recipes and flour blends people like are all a matter of palette -and what they are used to. So it would depend on the recipe you used, what kind of cookie you were looking to make in terms of taste, texture and appearance, and which Authentic Foods flour blend you used in your side by side comparison (Authentic Foods has several blends, including some with bean flour that I’m not particularly fond of either). I’m sorry folks, but if you can actually afford to pay almost $7/pound for flour, when wheat flour costs $.50/pound, then you have too much money. You are being ripped off because the ingredients are dirt cheap…just as with “organic” foods. You can make your own gluten-free mix by using equal quantities of white corn flour (not meal, instant potato flakes, rice flour & corn starch. For breads, the appropriate quantity of xanthan gum will help it to rise. Thank you for writing but I think you miss ed the point of what I was trying to say. Wheat flour at $.50 cents a pound isn’t an option for people with celiac and those who are sensitive to gluten, so whether someone has money or not isn’t the issue. The issue it that if you are going to pay $7 a pound for gluten-free flour, it should be make fabulous gluten-free baked goods and worked as directed. Cup 4 Cup does not. Cup4Cup is awful. I had cupcakes made with it from a bakery in NC, and they were doorstops. They most resembled biscuits. I’d never had it before, so I wasn’t sure if the bakers just didn’t know how to work with it (though they prided themselves on their GF products, all based on Cup4Cup), or if it was the mix, itself. All the same, the flavor and texture of the mix was terrible, and I was surprised at how many people extol it. Not I. I make my own blend based on Authentic Foods’ flours. So sad to hear that it is being used by professional bakers and that unsuspecting buyers will think that those cupcakes are as good as it gets. I hope your own baking efforts are much more delicious. By using finely ground rice flour– and a finely tuned recipe –we can all make incredible gluten-free baked goods. I’ve been very happy with cup4cup. I buy 25lbs at a time for $90 so it comes out $3.60 a pound (shipping included). I will say that I agree it can be sticky and that you do have to tailor it to what you are baking. I think the best thing to do when baking is to know what the proper consistency you need to achieve is before putting it in to bake. This is a trail and error endeavor but I always follow my gut…i.e. this is too dry, this needs more flour, this might need some extra starch. No matter what recipe I make I find they never work perfectly due to various circumstances (different flour, small vs large eggs, skim vs whole milk, etc). People love to say that in baking you need to follow the recipe exactly but I find that you need to follow your gut exactly instead. I have been feeding my friends (most non gf eaters) gf baked goods for ages and they have been the most successful since I started using the c4c (a friend even bought me a 25lb bag for xmas…best gift ever!). Some friends have been trying to convince me to start selling them (getting a commercial kitchen designation will probably prevent me doing that). I will say that I have not tried the Authentic Foods version (of course I must now) but I have tried many others and the cup4cup has been the best. I promise I’m not a paid shill for the company…lol. Well, there are flour mixes for all kinds of palettes. So you are lucky you found one for yours. If you’ve tried a lot of different ones, but never tried the finely ground brown rice flour from Authentic Foods (the one that I use in my all-purpose brown rice flour mix) then you don’t know what you are missing — yet. I hope you give my all purpose brown rice flour mix a try some day– and try one of my recipes. They’ll work for you without any trial and error or fine tuning. I will! I have tried your recipes btw and they’ve been great! (even with the c4c, lol). Hmmm . . . interesting! I have been gluten-free for two years, also mostly dairy. I have recently developed an allergic reaction three different times (twice went to ER). My allergist and I are trying to figure out what is causing this–lips and tongue tingle and burn and a tight chest (thankfully, no throat swelling, at least not yet), panic attack. In my research, I am finding out that xanthan gum may be the common culprit. I’m not sure yet, but it’s a possibility. I had a cupcake at a bakery that uses Thomas Keller’s Cup4Cup shortly before my reaction. I also ate cream cheese and had the same reaction–checked the label–xanthan gum! Third time still researching. So, maybe not xanthan, but a possibility. Anyone else have this? It is possible that you could be allergic to the xanthan gum. But you must also know that xanthan gum is in SO may different everyday foods that you might be buying at the store and eating in restaurants. It is also in many toothpastes. But most people who feel they are having a reaction to xanthan gum complain about intestinal issues like bloating, gas, etc. If you’e been dairy free – mostly- for two years, the dairy in the cupcake, and of course, the cream cheese, could also have been to blame- especially after two years because you could now be even more sensitive to it. Good luck tracking it all down! Thank you so much, Annalise. My allergist is doing tests soon to determine what the problem is. I have determined that I have Histamine Intolerance and many things elevate my histamine level, but something is sending the histamine skyrocketing to the point of an ER visit. Hopefully, these tests will show just what it is. Thank you for your concern and best of health to everyone. I cant tolerate the tapioca, any suggestions for substitutions? Option 1: replace all the tapioca flour with 1 cup arrowroot starch (which is usually more expensive). This will give you a slightly denser (and slightly wetter, depneding on the recipe) baked good. Option 3: replace 1 cup tapioca flour with 1/3 potato starch and 2/3 corn; then try 2/3 potato and 1/3 tapioca see which version you prefer in terms of texture. I bought c4c and tried it tonight with a recipe for my bread machine I used with wheat bread flour for years. I use the machine to mix and rise, take it out, knead by hand and shape and bake. It came out almost like traditional unbleached white bread, I was happy. After going gf, that was the one thing I missed, my homemade bread. I had been afraid to waste my bobs gf flour as I like it to bread meats. When I saw c4c at our local HEB supermarket for about $15/3#, I decided to give it a try. I will also like to try authentic to make homemade cupcakes, another missed item. It’s good that you were able to enjoy the bread you made with Cup4Cup. It’s pretty much an all-starch flour, so you must really like very, very white bread. But that is what’s so nice about the gf community recipe offerings- there is something for every palette! I hope you enjoy the cupcakes! We actually met at the Healthy Villi Celiac Conference in Boston. I was the British chef that has done multiple demos for Healthy Villi. Curiously, My English hs was doing a reunion and CEO at Dove Farm was in my year. I’ve just received a box of their gf flours to test. Plus I have seen them on Amazon, but pricey. Oonagh from Gluten Free Cooking with Oonagh. And for Julie, my recipes for National Foundation for Celiac Awareness are written with both imperial and metric quantities as well, but they often just publish the American cup measures. http://www.celiaccentral.org. Of course I remember you! And I am very familiar with your hard work in the community and your good recipes! I’d be very interested in knowing what you think of the Dove Farm flours. Write back please after the test run. I’ve always used the AF Multi-Blending regular recipes, with truly excellent results. Nothing else comes close, although the GF Bisquick and Betty Crocker brownies are pretty darn close! I don’t have the time or patience to store and measure ten different flours and gums every time I cook. Authentic Foods works every time. The Authentic Food’s Mulit-Blend is very close to my brown rice flour mix, which Authentic Foods makes and sells as GF Classic Blend. Even though I am not involved financially with the product, it is nice to have my flour blend already made up in a bag! The Multi-Blend has sweet rice flour, corn starch and xanthan gum in it, whereas mine does not (mine only contains brown rice flour, potato starch and tapioca starch. Multi-Blend also has a different proportion of rice flour to starch. But it works well for recipes calibrated to use it. Glad you found something you like!! I’ve had similar experiences with this flour. Makes good chocolate chip cookies. Ummm! but so do you! Your cookbook still reigns supreme in my home! Thanks! I do wish the flour had less xanthan gum, but it obviously works for the people who like it. So happy to hear you like those cookies! I just stumbled across your website. I bought your “Baking Classics” cookbook several years ago, and love the recipes! I have slowly been relying more and more on pre-made gf flour mixes due to a disability. I would be very curious to know how your wonderful all-purpose flour mix compares to Domata gf flour mix. I also experienced issues with the Cup 4 Cup flour. Using my very simple German Pancake recipe for comparison, the slimy, gummy texture was kind of disgusting, but it did rise higher than any other gf flour mix I’ve tried. I admit I have not tried your flour mix in this particular recipe yet. The Domata all purpose flour mix contains only white rice flour- no whole grain (my all-purpose mix contains brown rice flour and my bread flour mix has millet and sorhgum, also whole grain). The Domata flour contains corn starch (which is very different than potato starch and tapicioa starch in terms of texture and mouth feel in the finished bake good); and it contains xanthan gum and something called rice extract and tapioca dextrin (a gum-like substance). I am not a big believer in mixes that contain xanthan gum, as you know, if you are using my book. Yes, I would imagine that the Cup 4 Cup would make a slimy pancake with all that xanthan gum! And yes, it would rise high because of all that gum. But I have a similar recipe on this blog for a German-like pancake that you might find a bit more normal (tender and crisp and light): http://mygluten-freetable.com/2011/08/david-eyres-pancake-made-gluten-free/ I hope you can give it a try and let me know if it is closer to what you are trying to recreate. I hope so. But if not, I’ll try to help you — just let me know what you think should be different. I’m glad you are enjoying my recipes! I have another baking cookbook coming out late this fall. I hope you take a look to see if maybe it might contain some recipes that would make you happy! Have you by chance tested out the America’s test kitchen gluten free all purpose blend? I’ve just been diagnosed with celiac and I’m an avid baker (particularly of artisan breads) and I’ve been so depressed with the diagnosis….so i’m so happy to see your blog with such detailed testing! I’m looking for the best mix and i plan to test authentic foods but I just bought the ATK “how it can be gluten free” book which has a “magic” blend. I wonder if you have any testing data on it? Thanks and keep up the awesome blogging! I did give their blend a run but didn’t bother writing about it because it really isn’t a new blend -or magic. They basically did a permutation of Bette Hagman’s original blend from 1990 that was developed by home economists at the University of Washington. If you crunch the numbers, you’ll see their blend is basically 2 cups rice flour, 2/3 cup potato starch and 1/3 cup tapioca- with a little dry milk powder thrown in for color and protein- same as Bette’s; my all purpose is based on hers as well, except I use finely ground brown rice flour instead of larger grind white rice ( I actually have a section in my new book about the history of gluten-free baking in this country and a detailed discussion of blends and conterting recipes- if you are new at this, you might find it helpful). Bette Hagman’s also recommended using dry milk powder and did so in my of her recipes. Cup 4 Cup, which ATK studied for their book also uses dry milk powder. For breads, you might want to read my post about psyllium husk powder here on this blog (you can find the link on the home page). Although I have high regard for ATK, and even bought their book with high hope that I could learn something from them, I found their contention that they had break throughs in gluten-free baking kind of sad and ridiculous. They basically used other people’s work (including my cupcake test of showing half a cupcake for comparisons of flours and blends here from this post), and repackaged it and sold it under their name. Many of their baking recipes were convoluted and unnecessarily long and complicated. But the thing is, they have a good name and many people don’t realize. I hope you give some of my recipes a try, particularly the basic ones from Gluten-Free Baking Classics. They are simple and easy and you’ll find a few crusty and delicious artisan breads in it. Let me know if you have any other questions. I’d be happy to help as you get started on this new path. You’ll find the link on the top bar under Gluten-Free Baking (other categories include Home, About Me, etc). Scroll down menu links to Gluten-Free Flour Mixes link. http://mygluten-freetable.com/guide-to-flour-mix/ .